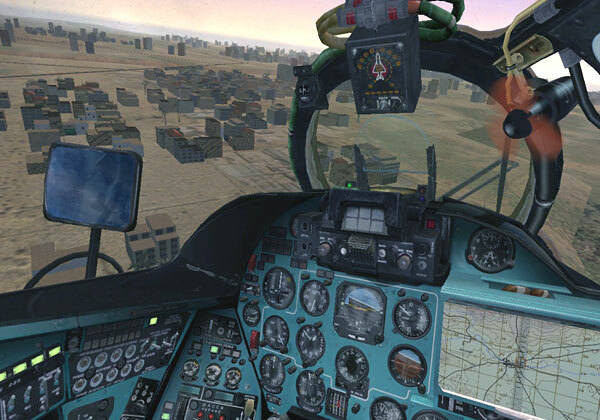 As a X-mas gift, EECH 1.11 and the Mi-24 cockpit has been released! Our very own SimHQ has done a review of it here, and also has links to the downloads. 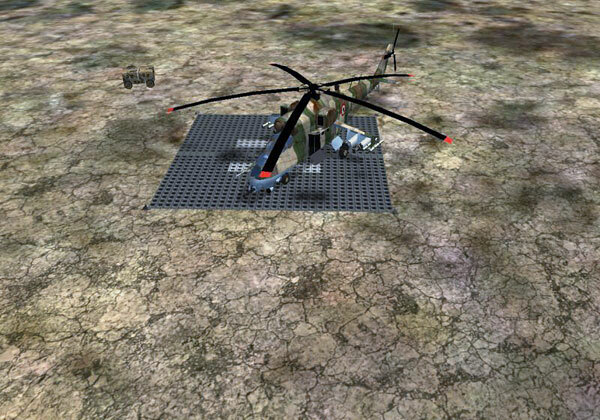 Added EO view for Mi-24, to simulate co-pilot using the sight. Enable with PgDn key. Adjusted start-up procedure for Mi-24 - timing, throttle response etc. Enabled adjustment of governor RPM for Mi-24V between 70% and 97%. Use ALT + , and . to adjust. Adjustment to trim function. It will now keep current cyclic/pedal values while trim button is held. This can be used to move cyclic/pedals to centre with button held to avoid sudden control input when centre position is moved. Added weight to Hind-specific weapons (YakB nose gun, Shturm missiles, S-5 rockets). They previously had no weight. Link to explanation of Mi-24 instruments. Video showing Mi-24 start-up procedure. Ctrl + F3/F4 change detail level (actually also works for Comanche and Ka-52). Doesn't seem to make much difference in frame rate on my PC, but I've removed a lot of details in the low detail mode so that it should be playable on old PCs. Note that some of the changes require use of the new gwut1110.wut file. So be sure to change your eech.ini file to use it. Congratulations on the release of the latest part of your project Arneh. It looks superb. Looks absolutely brilliant. Thanks for all the hard work! This was my most anticipated flight sim related release this year and now I can't play it because of a graphics card upgrade. Anyway, congrats Arneh; it looks amazing. You've extended the life of this sim beyond the expectations of anyone - including, unfortunately, video card companies. !!!!!! THANK YOU !!!!! And a Merry X-Mas to all of you. I am at work now but later .... yes baby!! I am so excited right now!! Thank you arneh!! -Sir in case of retreat, were we have to retreat?? Nice going ARNEH, we appreciate all your efforts. Look forward to trying this out over the Christmas break. Got 1.11 installed (upgrade to 1.10.2) without any problem. GREAT job, incredible x-mas gift !!!!!!!!!!!!!!!!!!! 'eech.ini' file itself it is written to put 'texture_colour=2'. I set both to '2' and it works, but should it be both ? - I got, for the first time, an abend with 1.11 stating 'terrain elevation off map' and CTD (desert terrain-campaign). I'll try to reproduce (hoping I can't). - External view of Hind: no zoom-in/-out, but that is most probably due to the model itself. Arneh ... you really outdid yourself (again) ! ... 1.11 Hind sure is in-cre-di-ble ! Last edited by SimFan; 12/22/08 07:37 PM. Saw your post at ED forum. It was a good day today after all! - eech.ini: in the 'readme' at install time it says to set 'texture_filtering=2', however in the 'eech.ini' file itself it is written to put 'texture_colour=2'. I set both to '2' and it works, but should it be both ? It should be just texture_colour, so readme is wrong. Not that it does any harm to set filtering to 2 too, but colour is the one which needs to be 2. External view of Hind: no zoom-in/-out, but that is most probably due to the model itself. Alt + , and . are used for engine governor now, so if you use those keys for moving then that won't work. But mouse wheel should still work. And if you mean actual zoom, and not just moving view distance, then ALT + F3/F4 should work for that. "Alt + , and . are used for engine governor now" Sorry, forgot about the new Hind key commands. "Zooming issue" is a non-issue. The new "Arneh flight model" setting is meant to be used for the Hind only ??? and re-set for the other choppers ? Setting it for e.g. the AH64D gets me killed (less forgiving) on occasion (drives me "into the ground")... but oh well as they say ... "It's a good day to die"
arneh.. Thanks for this great gift. I specially like the way AI choppers now don't turn on a dime... It actually looks like there is some inertia at work there now. Excellent immersion detail that was sorely needed.